Last fall I had just starting posting on a regular basis when I got distracted by traveling (who wants to buy me one of those newfangled portable computers? Anyone? ), the holidays, and whining about wanting a new apartment/career/home state, etc., and my poor blog, still in its infancy really, was lost in the shuffle. Now that spring is here, I have been itching to get back in my blogging saddle and talk about some of the new dishes that I have been inspired to make, including this unexpectedly delicious curried couscous. In general, I am the type of cook that plans meals ahead of time and makes long, categorized shopping lists (grocery shopping is my therapy; I find walking those aisles to be utterly relaxing). Sometimes, though, a new ingredient will catch my eye or there will be a great sale and I will pick something up and look for inspiration later. This is what happened when I saw some nice broccoli on sale last week. With some vague notions of a broccoli slaw, I brought home two heads and promptly forgot about them in the back of my fridge. Two nights ago I was digging through the fridge, trying to drum up some inspiration when I discovered the forgotten broccoli. I considered this broccoli slaw, which I have made before and love, but I didn't want to drag out my food processor or worry about making something to go with the slaw; that night I was all about ease. 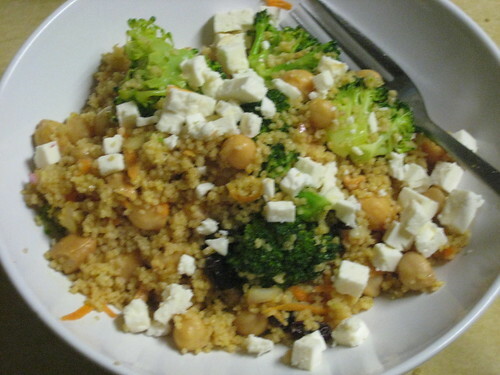 Then I turned to some of my favorite food blogs and websites* for ideas, and I came across this recipe for Curried Couscous with Broccoli and Feta on the Cooking Light site. Even though I like all of the ingredients (raisins, cashews, curry powder, chickpeas), I was a bit apprehensive about the combination. But the simple instructions and overwhelmingly positive reviews convinced me to give it a try, and thank goodness for that. This recipe is so quick and easy to throw together, and it tastes light and fresh, just what I crave when the weather turns warmer. The curry in this is fantastic; it is not overpowering, and it combines perfectly with the acidity from the vinegar. The chickpeas make this hearty enough for a meal, and the broccoli adds lightness and a filling bulk. What makes this dish sing, for me, is the crunch and richness from the cashews, and the sweetness of the raisins. It tasted great warm and also cold out of the fridge for lunch the next day, and for this reason I would highly recommend this for a potluck. The best part of this recipe is that it is so adaptable. You could swap in cooked quinoa for the couscous. If you don't jive on vegetarian you can add some cubed or shredded chicken. Almonds would be a good replacement for cashews, and go ahead and throw in some currents or golden raisins if that is what you have on hand. If I had had scallions I would have sliced some up and added them in. With all of these possibilities I know that I will be coming back to this recipe again and again, and not only on nights when I can't seem to muster the motivation necessary to prepare a meal. Bring the 1 3/4 cups water to a boil in a medium saucepan, then stir in the couscous. Remove from heat and let sit 5 minutes. At the same time, steam broccoli florets over simmering water, covered, for 3 to 5 minutes, until tender. Meanwhile, whisk together vinegar, oil, sugar, curry powder, ginger and salt in a large bowl. 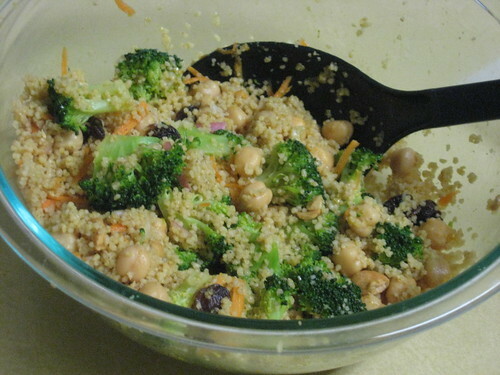 Fluff couscous with a fork, and add to dressing. Add broccoli, onion, raisins, cashews, and chickpeas and toss gently. Sprinkle with cheese and serve. *Speaking of food websites, has anyone been over to Gourmet.com recently? Instead of the old blurb about the website being shut down, there is now a message asking us to, "Check back soon for more information about Gourmet and its exciting new initiatives." I am hoping that this means that they will keep the site up and continue to add new content (an idea that fills me with happiness). I am keeping my fingers crossed! Note: Because I never stopped cooking or taking pictures of my food during my blogging exile, I will probably write up a few of the meals that I made during the fall and winter, and I will also update my flickr page with pictures and links to recipes for other dishes that I prepared.